Modern propulsion systems increasingly require higher levels of electronic control to boost performance and improve fuel economy. We assist clients by providing control concept studies of system architecture, transmissions control unit hardware and sensor and actuator selection, based on an objective selection tool. We also develop high-level control and low-level driver software that is fully integrated into the vehicle - including hybrid technologies. Control strategy is the key enabler for delivering fuel economy improvements and Ricardo has invested in developing the skills and expertise in these areas to provide world-class capability. Whilst new technologies may offer outstanding opportunities for large steps in CO2 emissions and performance, they have to be proven and accepted in the harsh automotive world. Ricardo have experience both with new technologies and also with many programs that are in or near production. We are ideally placed to offer support for taking hybrid and electric vehicle programs all the way from demonstration into production and beyond. We have a fully integrated tool chain that supports these areas of development spanning from concept and feasibility studies to assessment of prototypes, proof of concept and production. Ricardo has a strong history delivering engine, transmission, hybrid, electric and whole vehicle control from prototype through to production and the capability and experience to support customers throughout the value chain. 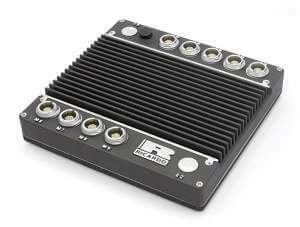 rCube2:Rapid prototyping ECU is a user ready rapid prototyping electronic control unit (ECU) based on AUTOSAR that enables fast and efficient development of control systems from initial concept to production.